Morgue Take 3 Almost ready! I have added the rest of the logic for the Morgue. I just need to test to make sure it works. There is one “effect” type thing I still want to do, but that might not be practical. Aside from that the Morgue is almost ready for release. - All conversations are configured. - All item drops are configured. - Return logic (for checking badge and shades) is implemented. I just need to test it. Regrettably I don’t have any fancy visuals to show you today! Today has been fairly busy though. Harebrained Studios linked to my youtube channel and wiki so I was fielding a decent amount of questions. I welcome the advice and suggestions! While I won’t incorporate all of it, I will at least consider it all. Additionally, all this advertising looks like it will be increasing our team, which means we’ll release that much sooner. I also spent a decent amount of time reorganizing the wiki. Once we finish cleaning up the layout, it will make creating future scenes MUCH easier. It will also allow us to track the progress. Its grunt work, BUT it will save us time in the future. Almost every Tenth Street “quest item” is in the game. I added a bunch of dialogue, its mostly flavor text, but that’s part of the game! The phone system is almost ready as well. The first infinite spawn room is ready, so now I just need to copy the method in the other locations. Working on stat’ing out the hire-able Shadowrunners. An updated version of the Morgue scene. I fixed a bunch of issues I was having and used a screen capture tool. The scene before the game begins when Jake gets gunned down in the alley. How many combat rounds do you think YOU can last? A quick post to share some accomplishments. The Morgue, and the items / information available is functioning properly even when you return to the room from outside. I still need to add the logic for once you have the sunglasses and badge though, so there is lots to do, BUT I will be posting an updated video tonight or tomorrow. Jake’s death scene is WORKING. I pounded on this logic for ages and now it finally works (mostly). You need to reload your character afterwards when it loads the Morgue, but that is only a slight annoyance. A video of that will be posted soon as well. Dialogue! The Business Man is fully configured! You can buy Frag Grenades and the Lone Star Badge. He’ll need to be edited when we decide if we are doing the Keyword approach or not, but then again, so will everyone. Glutman’s Secretary is also configured. But her dialogue is much less exciting. At the moment, my next steps are. Two new videos! Jake’s death and the Morgue version 2. Configure the scene with the wounded man. It should be quick. 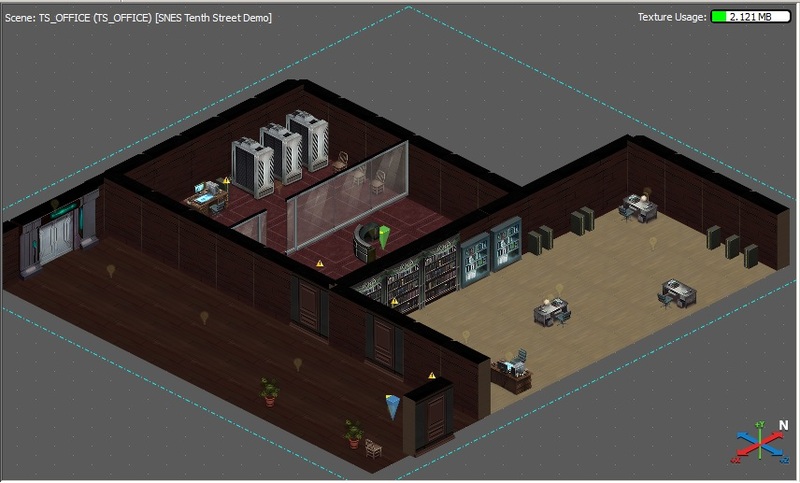 Add the logic for Jake’s apartment, including the save point and heal point. Work on the spawn rooms so that I am happy with how they behave. This will be a short update since again I am up too late. Hamfist and Jagadance have been spec’ed out in the editor. They probably need to be rebalanced but they are there! I know how to do the infinite respawn rooms. The trigger logic is easy enough. The hard part is properly placing the regions so that eventually combat stops. The Morgue has been updated and I will likely release a better quality video. Jake’s demise, the opening scene before the game begins, is almost ready. I’m having some trouble with NPCs not doing what they’re told to, but that should be fixable next time the editor is updated. I’ve also encountered one annoying problem. Even outside of combat, movement is turn-based. That means I cannot have wandering NPCs. They will have to be set in specific locations except in special circumstance. And I'm up too late... But MAPS! Two more locations are mapped out, the office building and the restaurant near the rail station. 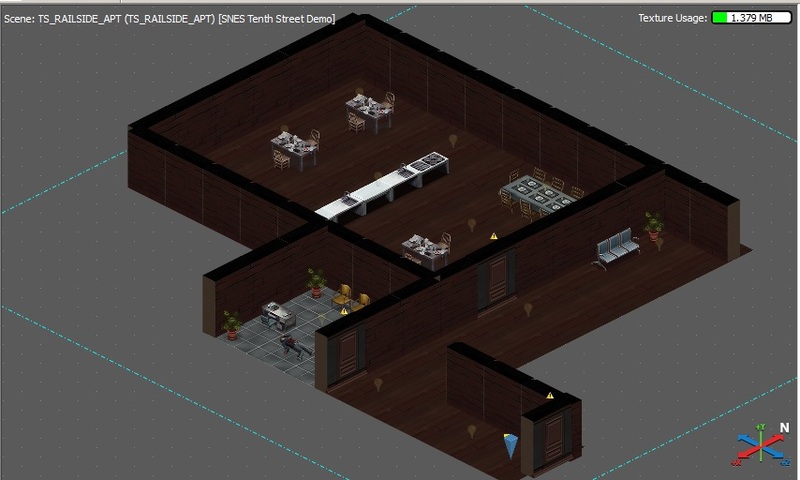 The restaurant will be interesting dealing with the injured man and the enemy spawn room. I like Glutman’s office, but the other room seems much to spread out. Then again it will have three NPCs trying to kill you… I definitely want to add more filler to it. With the completion of these two maps, there are three locations left on Tenth Street to map. Based on time constraints I had planned on releasing those scenes AFTER the alpha release. For those who don’t remember, I was aiming at the alpha (Tenth Street Demo) release for within a week of the game’s release date. Unless the logic takes longer than expected, I should be well on target for that goal. I may even be able to get the extra locations in too. If you want to ensure I get it out on time though, I could use help with the NPCs! There are a lot to choose the appearance of and to stat out. If I can concentrate on the trigger logic instead of worrying about their specs, it will definitely help me release on time. As promised, I’m able to generate one map a day. I wish I could go faster, but there is only so much time. This is the building with the business man in it. I haven’t added the NPCs to the combat room yet, nor have I added the business man’s conversation. I also made some random fixes to other maps which aren’t worth mentioning. 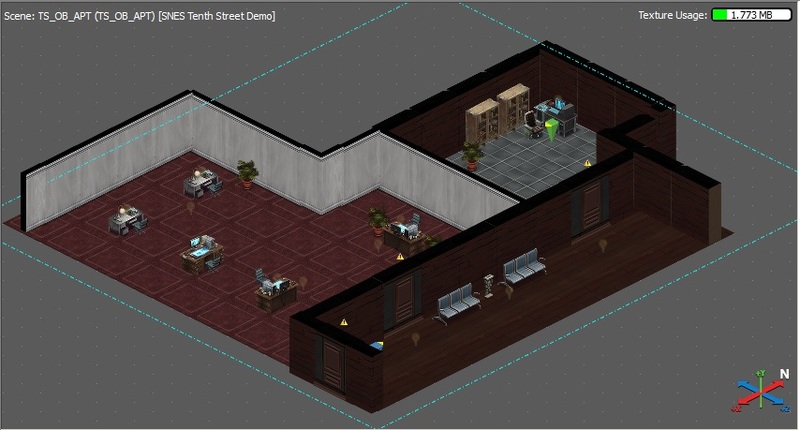 I changed Decker’s behavior so that the first time you enter the office block you will see him running to the alley. Lastly, just for fun, I added the credits to the Morgue slabs. Later in the week I plan on making another quick video. I want to show the updated Morgue scene and I might as well show people the pursuit of Decker. As for the next maps I’ll do, I expect I’ll do the building you find your key in. That way I can implement the lock logic when I fix the infinite spawn rooms. Lastly, if you didn’t see my post earlier, I need help spec’ing out the NPCs! Read post9 for more info. This will tells you how to generate the “random code” for an NPC’s appearance. Does anyone want to spec out some characters based on the info in the wiki? If you want to help with this, comment in our forums. Comments should go in this forum. Not a whole lot to report for today’s progress. I fixed some issues in the earlier scenes. The Morgue intro text is much easier to read (or to skip), I added it to a conversation instead of using popups. The only thing new I have to show today though is The Grim Reaper Club. I need to carefully go through all the picture options to spec out the NPCs in the room. I kind of chose them at random. Giving them dialogue won’t be too bad. As I said before though, I’m going to wait on dialogue and most triggers until I have everything mapped out. One last thing, if any of you have the time, I really could use some screenshots of “The Cage”. I haven’t had the chance to get them yet. Jake’s apartment has been created. Granted I feel I will likely need to recreate it, there is a lot of clipping with the walls. I almost have the infinite spawn room figured out, though its giving me a little trouble. Aside from that I linked all the maps together so you can freely wander and fixed some random issues. I expect I will map out a single region every day. Sadly the real world keeps me too busy to do more. Still, at a region a day, I should have Tenth Street mapped by the end of the week. Then I will work on adding all the NPCs. There is an additional easy / small job I need help with as well. I need someone to spec out NPC templates for the various bad guys. There are a lot of options to wade through, and sadly I don’t have the time (or a big enough monitor) to do so. I will make the time eventually, but if someone else could stat them out it would be amazing. Also, some people have commented on the simplicity / lack of detail on the maps. That is temporary! The plan is to release an Alpha version which contains the basic maps, dialogue, etc. This will be as close to the SNES version as possible. The beta version will start to pretty things up and expand the game. And wow, its 4:30AM, time flies. Good night!